The ‘00s were a big time for any emo as emotional music hit the mainstream media. Huge bangs, the darkest eyeliner, and more studs than you could count were all the rage; the craze took the world by storm and saw millions of teenagers and young adults finding their identity. The emo era saw bands that before would only have played in underground venues appear at some of the biggest festivals, and even make their way onto radio stations. Here are the best eyeliner-wearing, black-haired bands we played on repeat for all those years that we’d totally forgotten about until now. This fivesome made their first major breakthrough in 2004 with Three Cheers for Sweet Revenge. Their following album, The Black Parade, was released in 2006 with both quickly becoming the soundtrack for any emo. Lead singer, Gerard Way, put on shows that were more like theatrical performances as he wanted to give the audience an experience like no other. 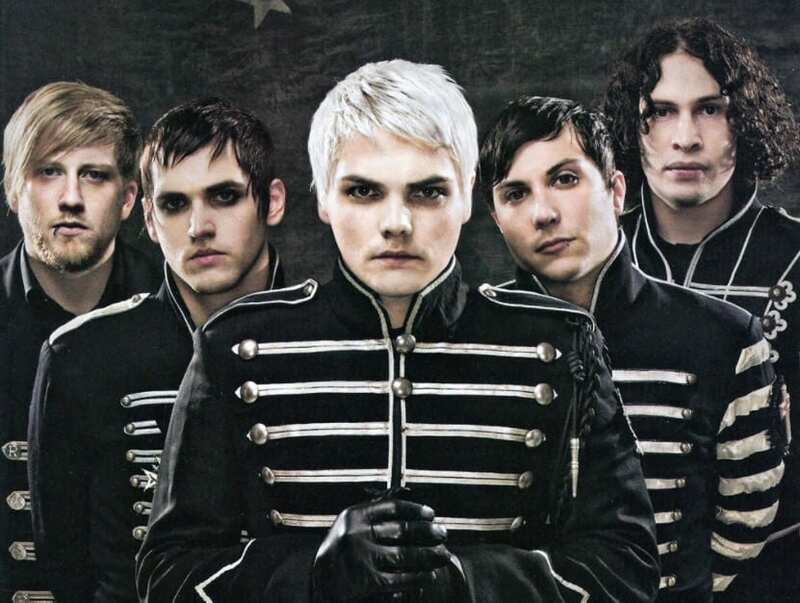 But let’s face it, even now no one can resist singing along at the top of your lungs when the first note of Welcome to the Black Parade hits; military jackets at the ready, boys. The first guitar strum of I Write Sins Not Tragedies is as nostalgic as they come! When the song was first released in 2005, the group shot to one of the top spots of the best emo bands list. The heavy eyeliner (and singing that rude word!) made everyone listening to the band’s first album feel like the ultimate rebel. Wasn’t being rebellious just part of the package? The Las Vegas-born band had a massive success from the album, A Fever You Can’t Sweat Out, and went on to live out their reign as some of the emo gods with their next few album releases. This band was different to most other groups as they didn’t have the look everyone else seemed to be sporting, apart from one member: Pete Wentz. The bassist was enough emo for everyone, and his long black hair and makeup was one of the founding looks of emo guys everywhere. In 2005 when Sugar, We’re Goin Down was released the band became legends in their own right. It was hit after hit for Fall Out Boy as they went on to release two more hugely successful albums before their three year hiatus in 2010 – they were sad times. One of the most famous bands with a female lead vocalist was Paramore, led by Hayley Williams. This group gave women everywhere a major role model (and plenty of people a huge crush) when they burst onto the scene in 2007. This is also when Misery Business became the anthem of many emos everywhere. Their heavy guitars teamed with the unique singing voice of Hayley Williams made the group one of the leading bands towards the end of the emo movement; we can feel the eyeliner coming back out already. Alex Gaskarth and co are members of a very different emo band: All Time Low. Even so, the group were there from the get-go but found fame in 2007 when emos everywhere were singing along to Dear Maria, Count Me In because we had their picture, and we were coming with you. The four men went on to have further hits from their album Nothing Personal which meant the band was soon plastered on the walls of bedrooms everywhere. Everyone needed their pop-emo band, and All Time Low was definitely this. The decline of emo since 2010 seems so far gone, but at the back of closets everywhere lays the band t-shirts, the skinny jeans, and the unbelievable collection of Converse. While we may have since changed dress sense (and learned how to put on makeup), no one can ever take our musical roots away from us. Through the good times and the bad, these bands made us who we are, and we’re proud to still sing their songs with pride.